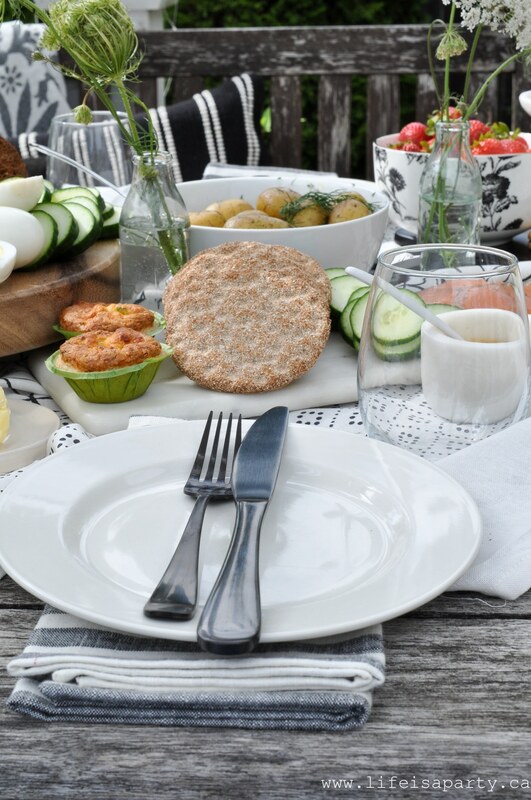 Swedish Inspired Midsummer Picnic: Enjoy drinks, smorgasbord, and dessert all inspired by a traditional Swedish Midsummer menu. 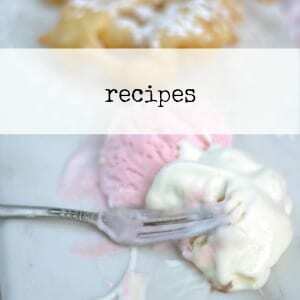 Easy to create at home, and so delicious! 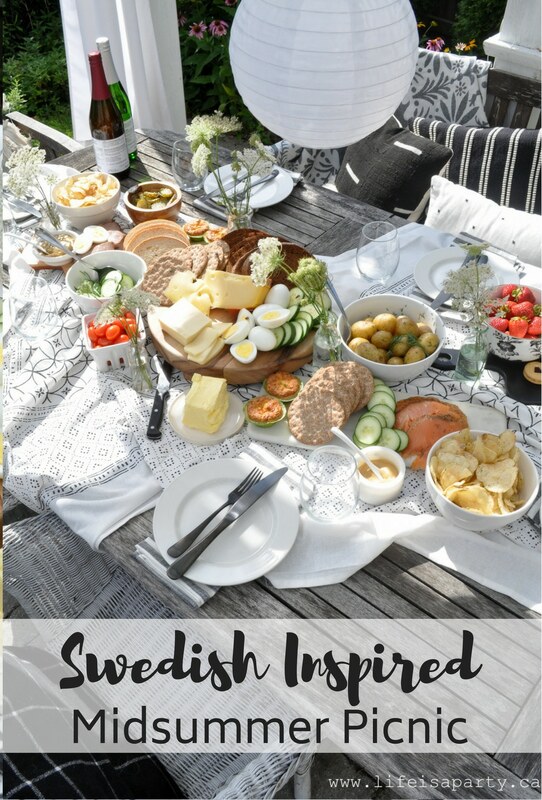 I’m so excited to share my Swedish Picnic with you! 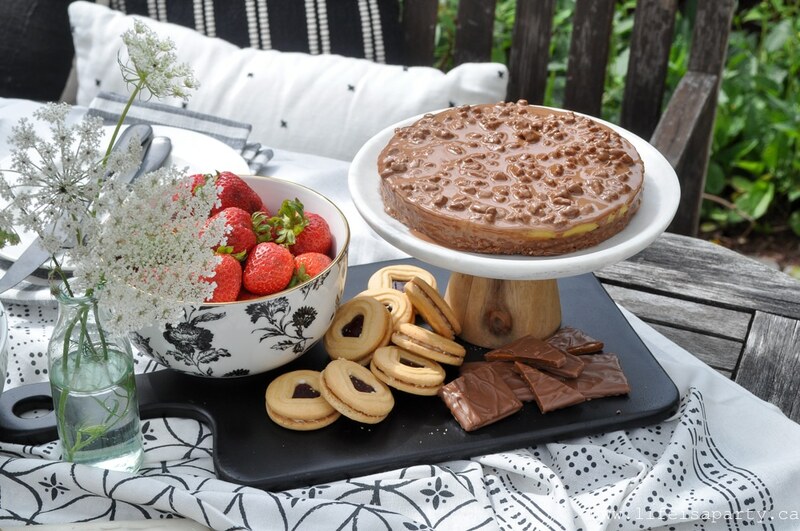 We’ve been inspired to create picnics inspired by different international cuisine this summer. 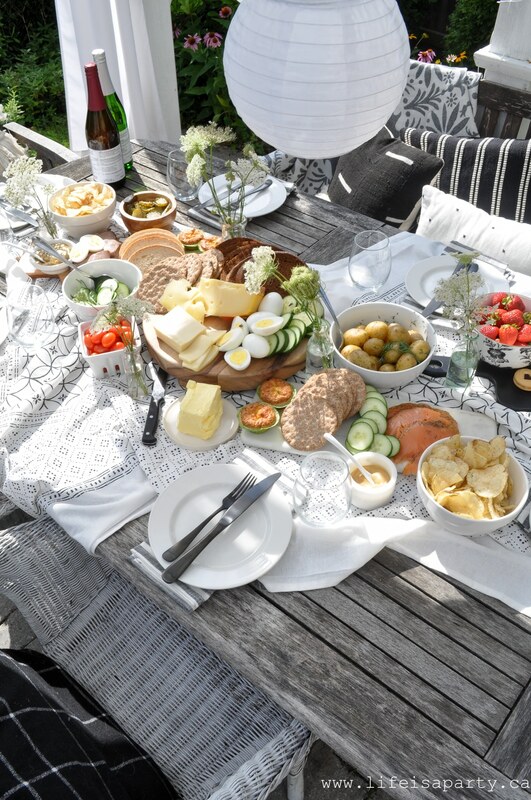 Our first one was a British Inspired Picnic -check it out here. 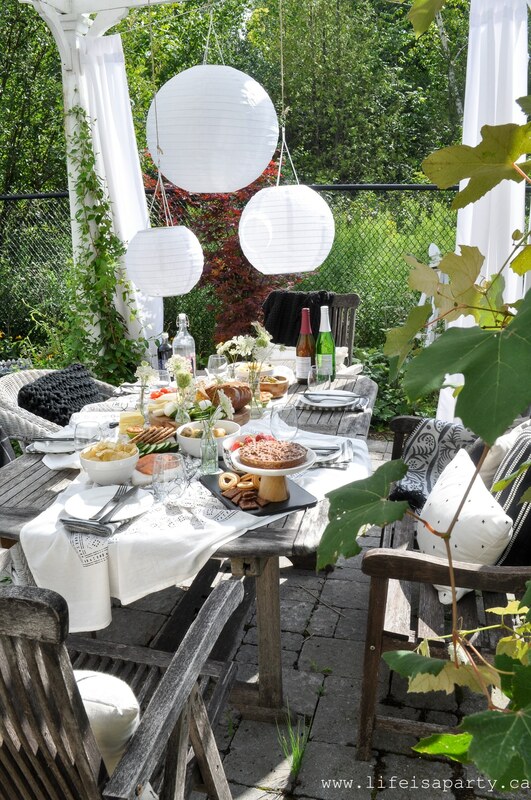 And today, we’re sharing our picnic inspired by Sweden and their traditional midsummer picnics. 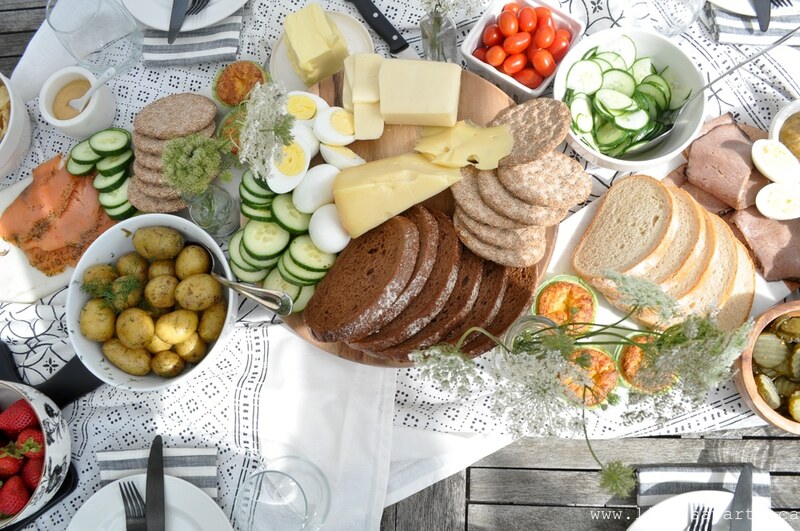 Midsummer celebrates Equinox, or the longest day of the year, and in Sweden it usually involves an outdoor picnic, flower crowns, and a great menu. This usually takes place around the end of June. We’re past midsummer, but since here in Ontario our kids summer holidays from school are in July and August, we’re right around the mid point of our summer break now, so it seemed appropriate. 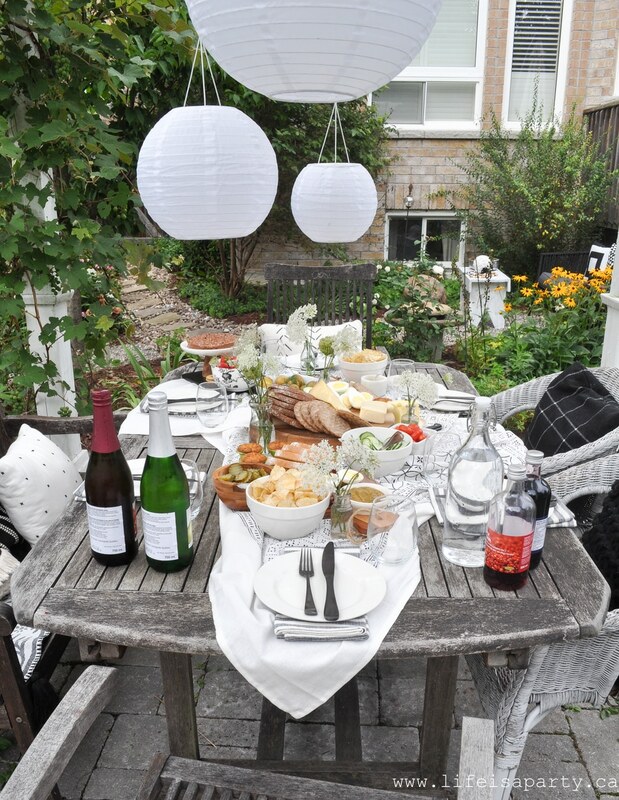 This picnic was really pretty simple to put together. A few months ago, I asked my Facebook readers “what keeps you from entertaining more?” The most popular answer was “my house”. 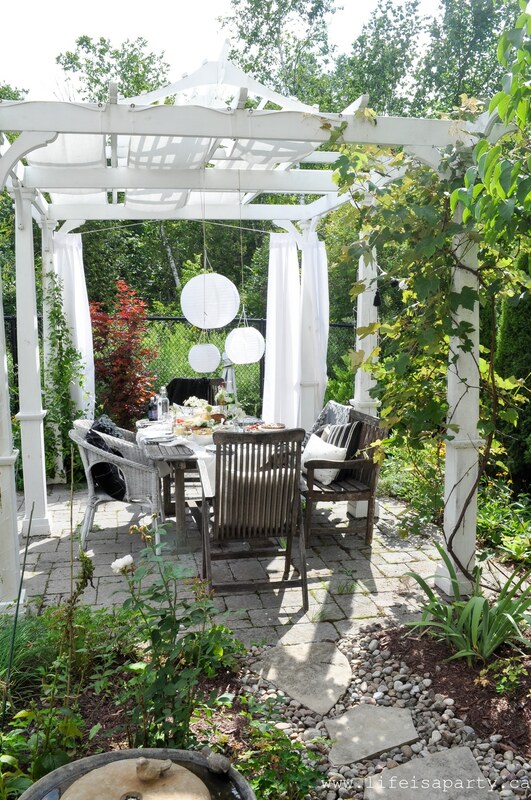 Some felt overwhelmed by getting the house looking company ready, some didn’t have enough space to entertain, and others felt they needed some major renos or redecorating before entertaining. Those answers inspired this series of picnics. 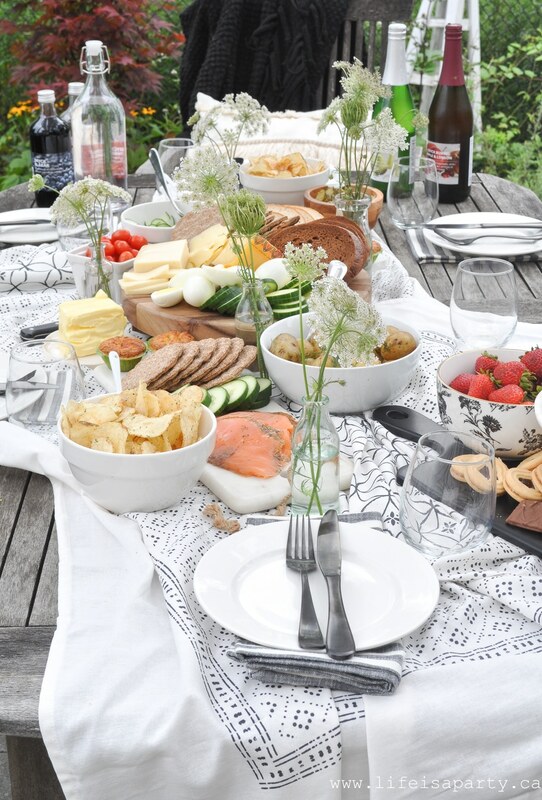 The perfect solution to not entertaining at home is to go on a picnic with friends. 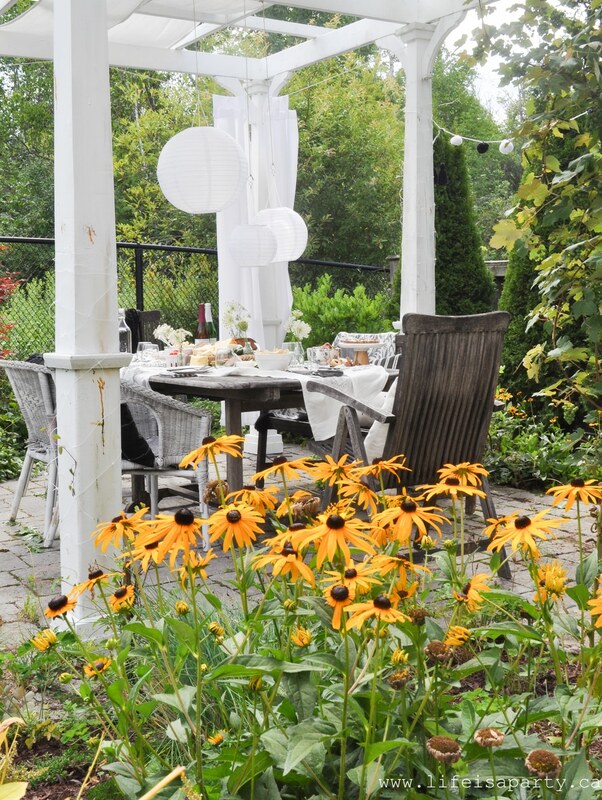 We set up this picnic in our backyard -which might work for someone who doesn’t have enough space inside but has some outdoor space. But you could also pack it all up and serve it at your local park too. I decided to go with a black and white theme. It’s a real favourite of mine lately, but seemed perfect for the Scandinavian vibe. 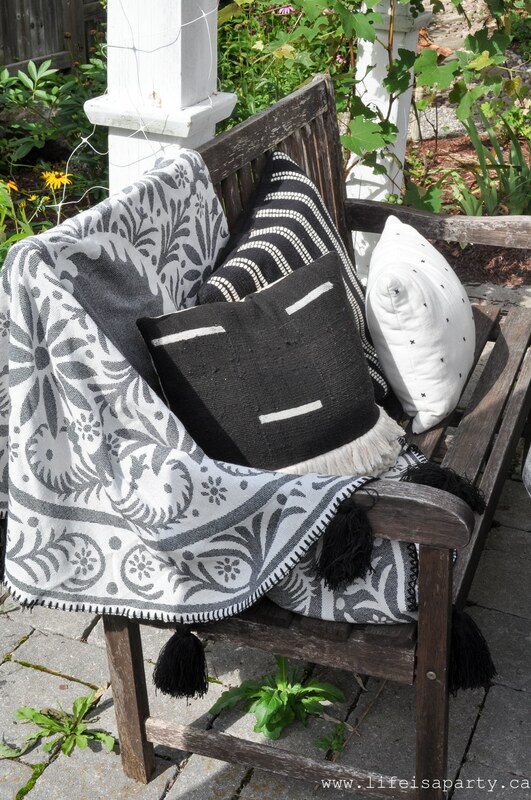 I shopped my house for the pillows, and they really do make the chairs so comfy and perfect for lingering. 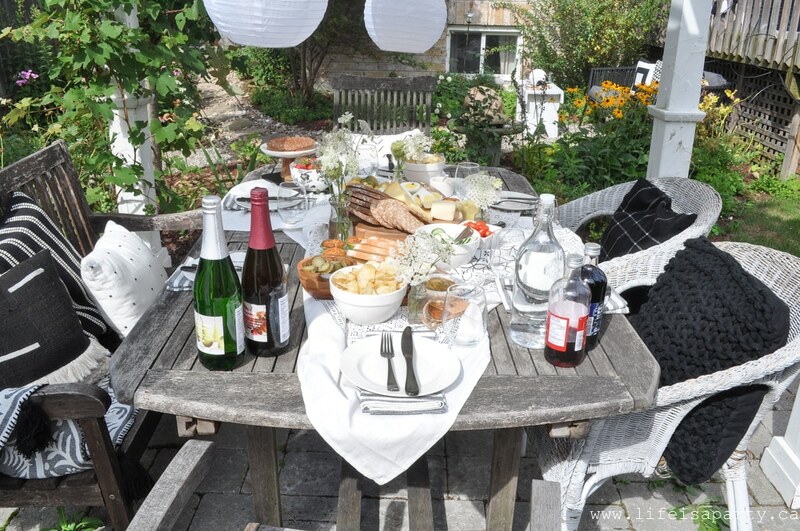 We kept the table setting pretty and simple -with just a side plate, napkins, black cutlery, and a stemless wine glass. 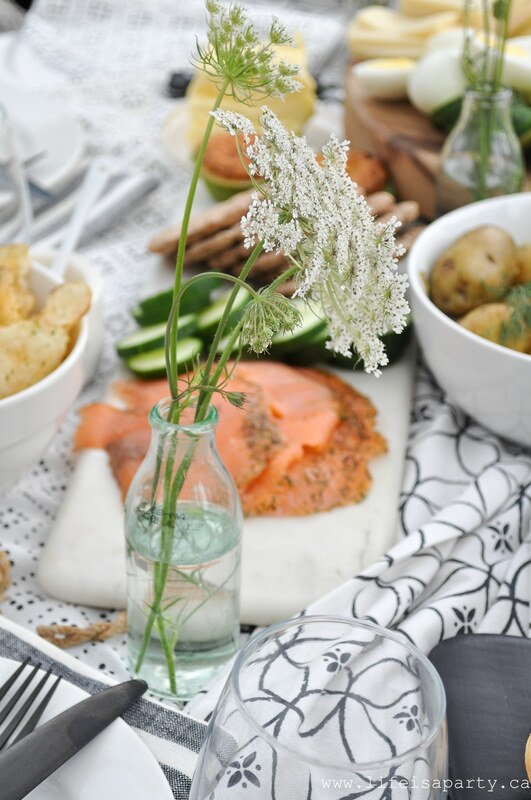 For flowers, I picked some Queen Anne’s lace and used some little glass bottles to add some around our smorgasbord. 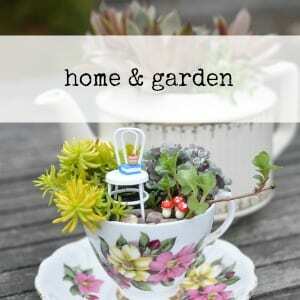 So pretty and summery. The menu was a lot of fun to put together, and something a bit different. 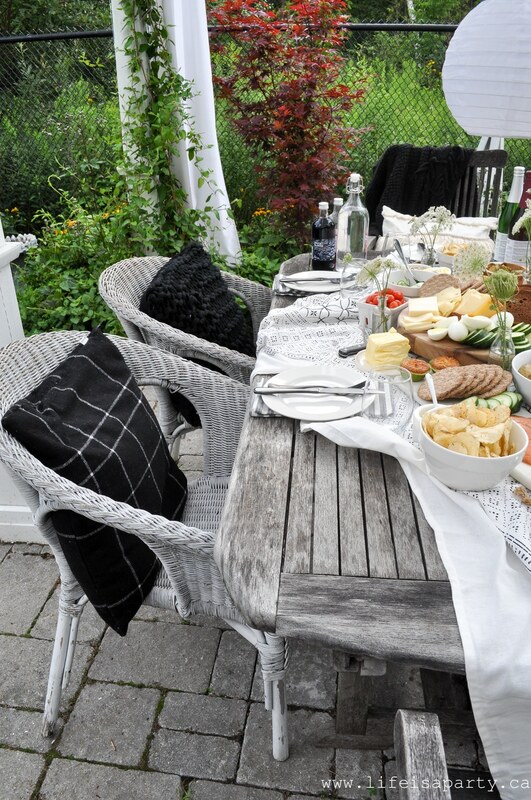 I’ve never been to Swedish picnic before -here or in Sweden, but after my research I knew I would like to! To make things easy, we headed to Ikea for a lot of the picnic food. 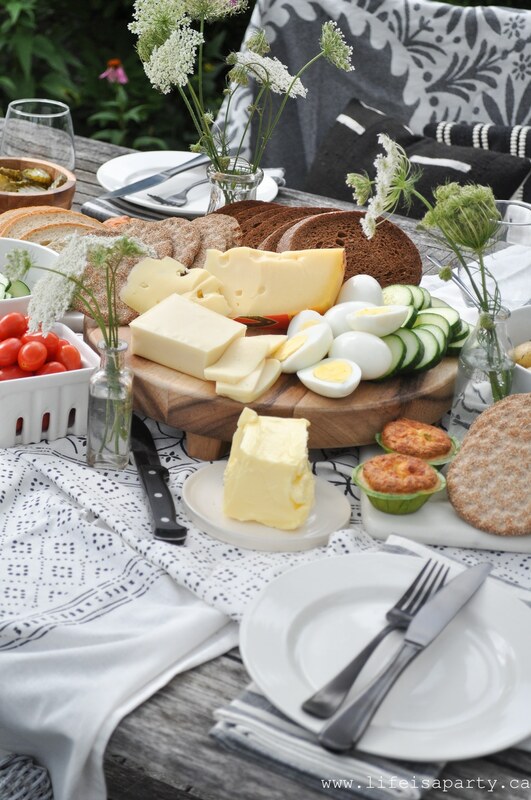 I did a little research on-line ahead of time, I had a good idea of the standard picnic fare for a Midsummer Swedish Picnic. I learned all about smorgasbord. 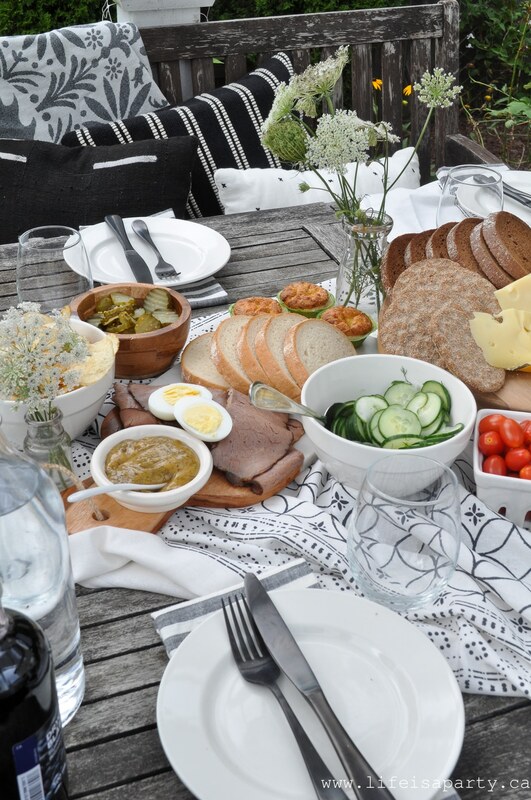 They’re traditional Swedish fare, and always involve bread, butter, and cheese. They’ve usually include fish -like pickled herring which we skipped, but include salmon. Smorgasbords have come to include both hot and cold dishes and in North America are now usually referred to as buffets, and can be quite extravagant. 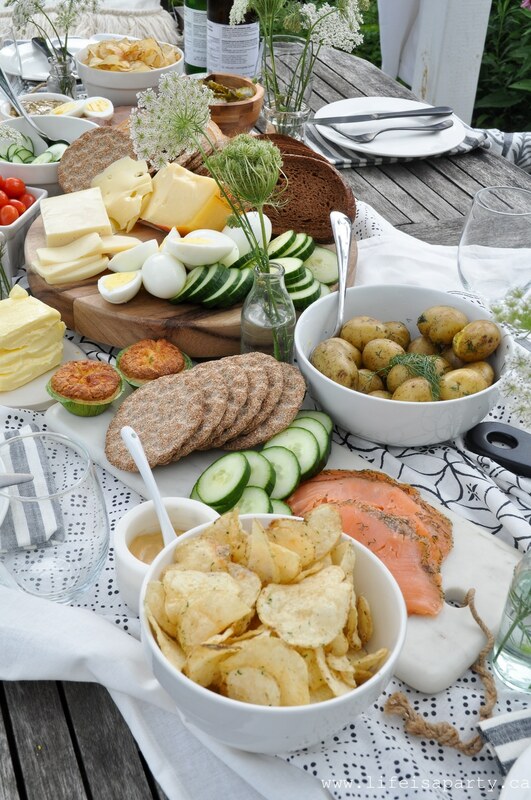 I was guided by the traditional smorgasbord for a Midsummer picnic, and also what was easily available here in Canada. I did find lots of great additions on my trip to Ikea. 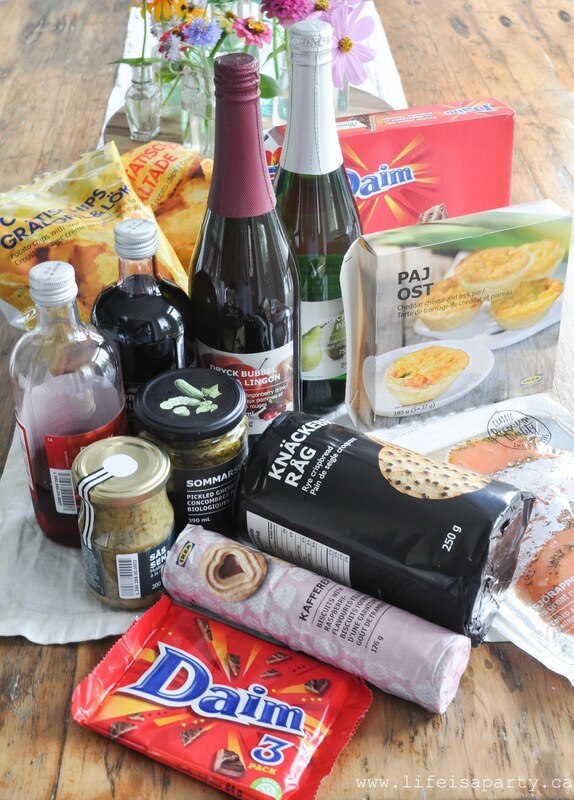 Here’s what we picked up at Ikea, to make this picnic a little easier. 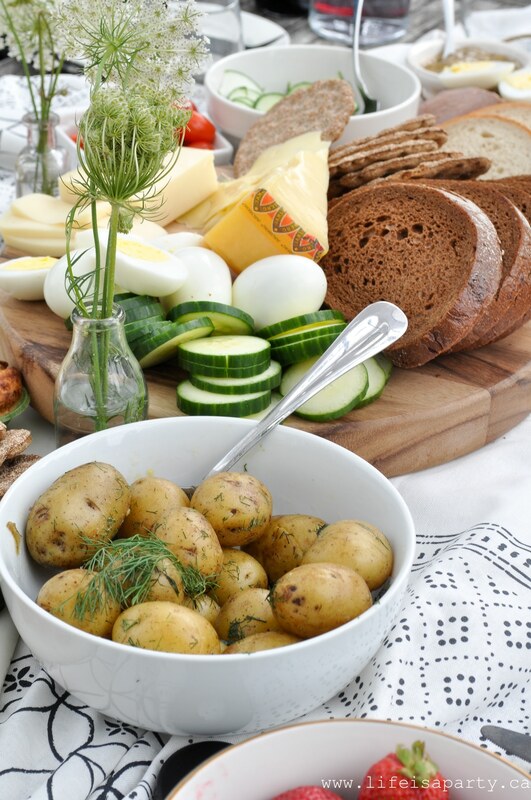 The only things I had to actually cook were the new potatoes -which were boiled and then I added butter and fresh dill to, and the cucumber salad. For the cucumber salad I sliced a cucumber very thinly and then made a dressing of 1/4 white vinegar, and 3 tbsp sugar, and some fresh dill. This cucumber salad was like a quick pickle and delicious with everything else. 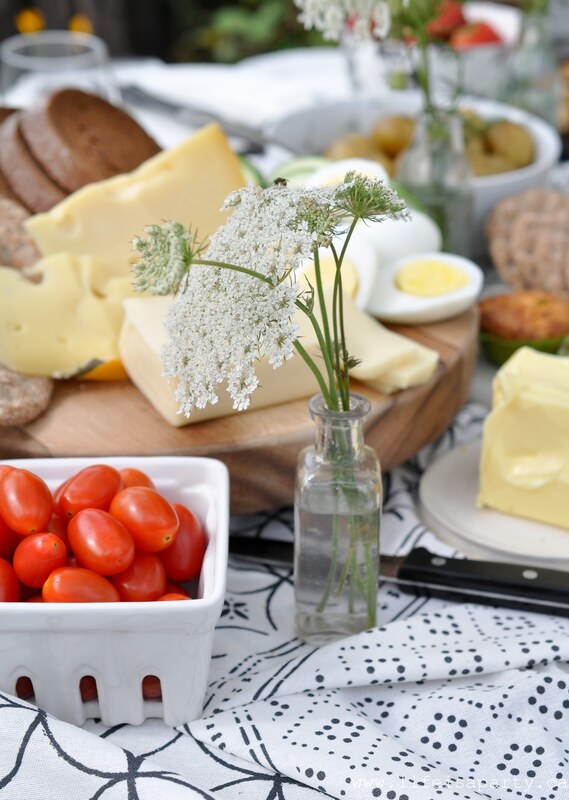 I wasn’t able to find authentic swedish cheeses here, but found on line that a Jarlsberg or something similar and soft cheese like Havarti were great substitutes. I’ve never really cooked much with dill, but it seemed like a really prevalent addition for Swedish food. I added it to the potatoes and the cucumber salad and we all really enjoyed it. The glass bottle was picked up at Ikea too, and it’s perfect for cold water. 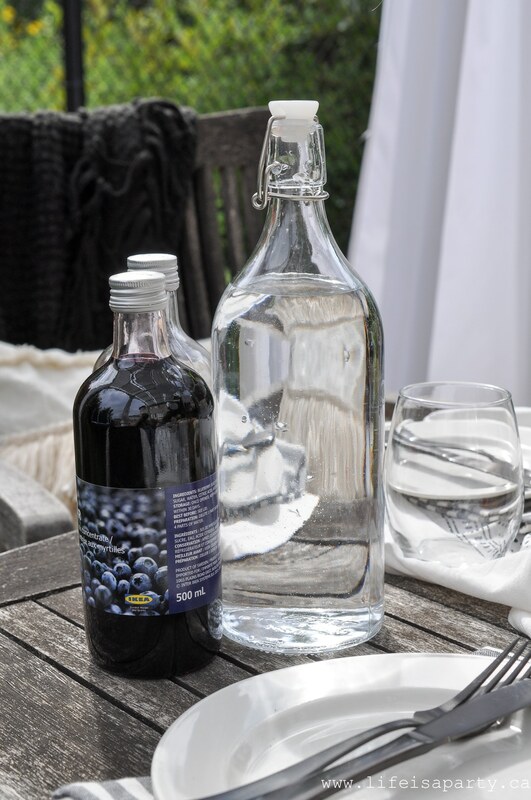 Guest could have plain water or add in the blueberry or lingonberry syrup. 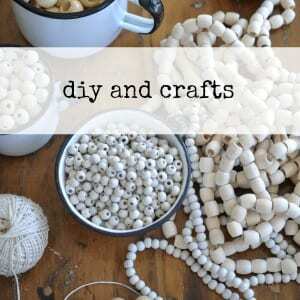 Stemless wine glasses were perfect for water, the juice mixture, or the sparking juice. 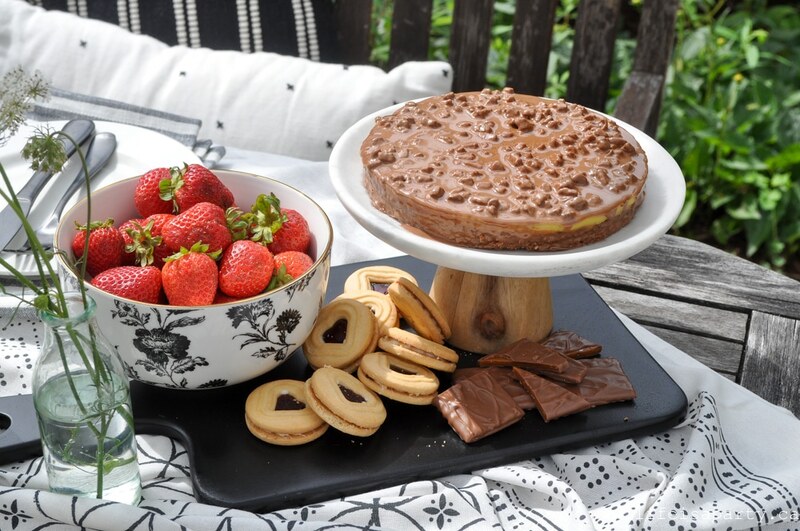 I also found on-line that strawberries are a must for a midsummer picnic -either in a dessert or on their own. We loved our dessert tray, and just kept nibbling on the chocolate, strawberries, and cookies as we talked the night away. This theme was so fun to put together. 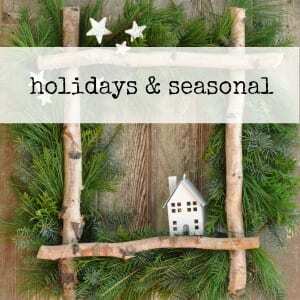 I loved that it was little bit different, but there was still something for everyone -even the kids, to really enjoy. 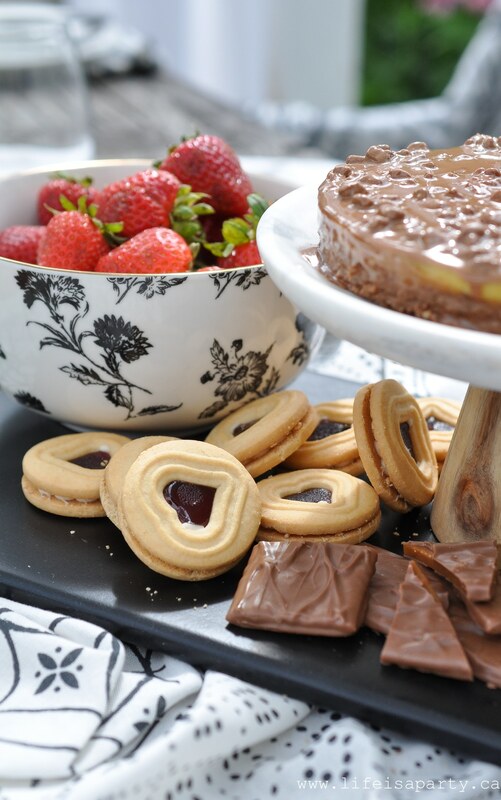 It was great creating a true smorgasbord so everyone could help themselves. And it was a real hit with the guests. 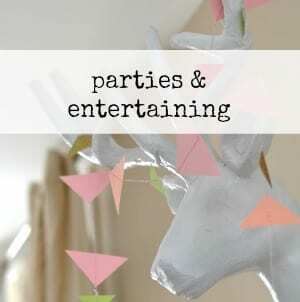 Such easy entertaining, where everyone lingers at the table and keeps going back for a little bit more, or try another combination. 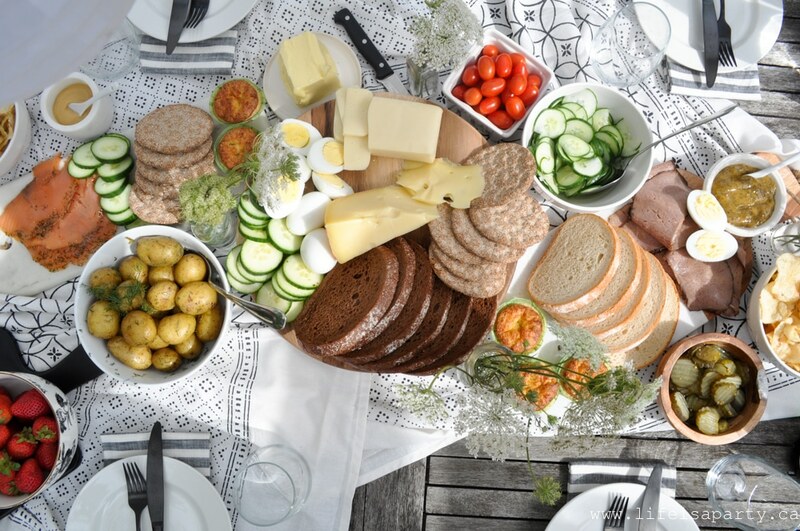 If you’re up for a little adventure this summer, but maybe not able to actually do much traveling, I really highly recommend trying an international picnic like this one. 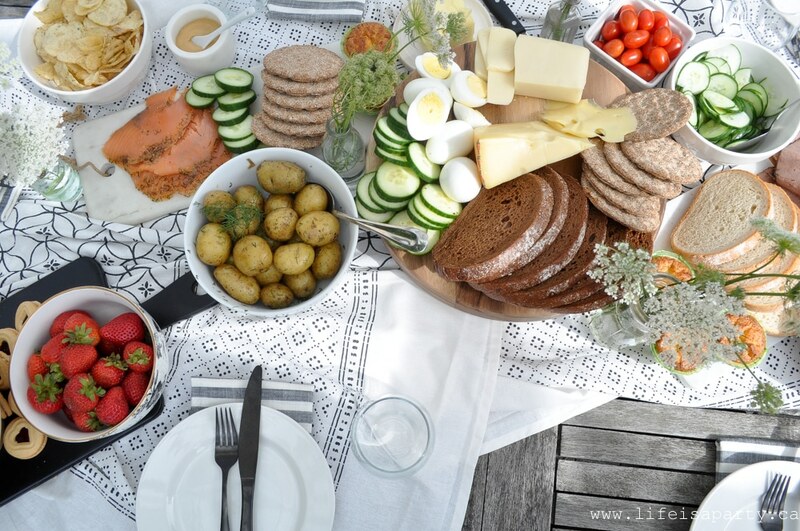 With a Swedish Inspired Midsummer Picnic, life really is a party!